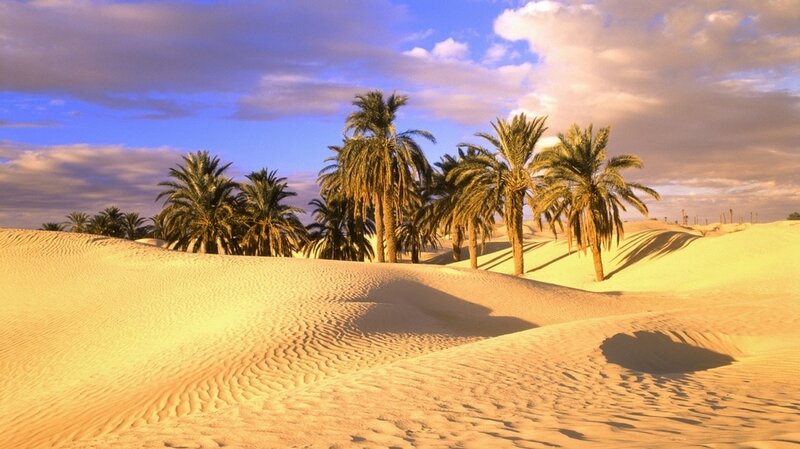 ​TURNS DESERT INTO A GARDEN! soil found in the Amazon Basin. It is also known as "Amazonian dark earth" or "Indian black earth". It can be produced very simple anywhere in the World. ​AND I WILL BRING YOU ALL YOU CAN EAT! “Faced with an ecological problem, the Indians fixed it. CULTIVATE IT & REAP A PARADISE! ​TURN DESERT INTO A GARDEN! ​In this documentary a legendary civilization thought to be too good to be true on the basis of the stories told by the Spanish explorer Francisco de Orellana, is found to be a real part of history. CULTIVATION SHOCK: STARVATION IS OVER FOREVER or GOLD ? BRING ME CHARCOAL AND I WILL BRING U ALL U CAN EAT! El Dorado / the Amazon basin rainforest pre-Columbus found themselves ahead of practically the rest of the world by: harmony and balance with their environment. Within a couple of hundred years, ALL OUR SOIL could be TERRA PRETA and there would be no malnutrition, while we could rest under the shade of trees that grow taller, and pick their fruits that ripen fuller than ever before. ​Some may call this idealism, and I call their lack of imagination, idiotism. Here's to the magic of life, and the end of strife. Basically, it’s organic matter that is burned slowly, with a restricted flow of oxygen, and then the fire is stopped when the material reaches the charcoal stage. Unlike tiny tidbits of ash, coarse lumps of charcoal are full of crevices and holes, which help them serve as life rafts to soil microorganisms. The carbon compounds in charcoal form loose chemical bonds with soluble plant nutrients so they are not as readily washed away by rain and irrigation. ​Biochar can dramatically improve plant growth while helping retain nutrients in the soil. The idea of biochar comes from the Amazonian rain forests of Brazil, where a civilization thrived for 2,000 years, from about 500 B.C. until Spanish and Portuguese explorers introduced devastating European diseases in the mid-1500s. Using only their hands, sticks, and stone axes, Amazonian tribes grew cassava, corn, and numerous tree fruits in soil made rich with compost, mulch, and smoldered plant matter. Amazingly, these “dark earths” persist today as a testament to an ancient soil-building method you can use in your garden. Scientists disagree on whether the soils were created on purpose, in order to grow more food, or if they were an accidental byproduct of the biochar and compost generated in day-to-day village life along the banks of the Earth’s biggest river. ​However they came to be, there is no doubt that Amazonian dark earths (often called terra preta) hold plant nutrients, including nitrogen, phosphorous, calcium and magnesium, much more efficiently than unimproved soil. Even after 500 years of tropical temperatures and rainfall that averages 80 inches a year, the dark earths remain remarkably fertile. Scientists around the world are working in labs and field trial plots to better understand how biochar works, and to unravel the many mysteries of terra preta. At Cornell University in Ithaca, N.Y., microbiologists have discovered bacteria in terra preta soils that are similar to strains that are active in hot compost piles. ​Overall populations of fungi and bacteria are high in terra preta soils, too, but the presence of abundant carbon makes the microorganisms live and reproduce at a slowed pace. This the most practical and the quickest way to make the Biochar. ​and observing old charcoal burning sites. Some of the accounts are very interesting, especially those the discuss long term observations of the old pits where charcoal was once burned, which remained fertile for decades. To the left, an oxisol poor in nutrients, typical of the Amazon basin; right, oxisol transformed into fertile terra preta Terra preta (Portuguese pronunciation: [ˈtɛʁɐ ˈpɾetɐ], locally [ˈtɛhɐ ˈpɾetɐ], literally "black soil" in Portuguese) is a type of very dark, fertile manmade (anthropogenic) soil found in the Amazon Basin. It is also known as "Amazonian dark earth" or "Indian black earth". In Portuguese its full name is terra preta do índio or terra preta de índio ("black soil of the Indian", "Indians' black earth"). Terra mulata ("mulatto earth") is lighter or brownish in colour. Homemade terra preta, with charcoal pieces indicated using white arrowsTerra preta owes its characteristic black color to its weathered charcoal content, and was made by adding a mixture of charcoal, bone, and manure to the otherwise relatively infertile Amazonian soil. A product of indigenous soil management and slash-and-char agriculture, the charcoal is very stable and remains in the soil for thousands of years, binding and retaining minerals and nutrients. of high quantities of potsherds; of organic matter such as plant residues, animal feces, fish and animal bones and other material; and of nutrients such as nitrogen (N), phosphorus (P), calcium (Ca), zinc (Zn), manganese (Mn). Fertile soils such as terra preta show high levels of microorganic activities and other specific characteristics within particular ecosystems. Terra preta zones are generally surrounded by terra comum ([ˈtɛhɐ koˈmũ] or [ˈtɛhɐ kuˈmũ]), or "common soil"; these are infertile soils, mainly acrisols, but also ferralsols and arenosols. While deforested arable soils in the Amazon are productive for just a short period of time, and farmers are constantly moving to new areas and clearing more land, the terra preta soil is less prone to nutrient leaching caused by heavy rains and floods because of its high concentration of charcoal, microbial life and organic matter; accumulating nutrients, minerals, and microorganisms. Terra preta soils are of pre-Columbian nature and were created by humans between 450 BCE and 950 CE. The soil's depth can reach 2 meters (6.6 ft). ​Thousands of years after its creation, it has been reported to regenerate itself at the rate of 1 centimeter (0.39 in) per year by the local farmers and caboclos in Brazil's Amazonian basin, who seek it for use and for sale as valuable potting soil. Most carbon in the soil is lost as greenhouse gas (carbon dioxide, CO2) into the atmosphere if natural ecosystems are converted to agricultural land. Soils contain 3.3 times more carbon than the atmosphere and 4.5 times more than plants and animals on earth (1). This makes soils an important source of greenhouse gases but also a potential sink if right management is applied. The use of crop residues for bio-energy production reduces the carbon stocks in cropland. Further the dedication of cropland to bio-fuel production increases the area of cultivated land and thus carbon loss from soils and vegetation. Pyrolysis of waste biomass can generate fuels and biochar recalcitrant against decomposition. If biochar is returned to agricultural land it can increase the soil’s carbon content permanently and would establish a carbon sink for atmospheric CO2. In this case the use of crop residues as a potential energy source may improve soil quality and reduce greenhouse gas emissions in a complementary not competing way. Biochar is proposed as a soil amendment in environments with low carbon sequestration capacity and previously depleted soils (especially in the Tropics). From previous studies it is known that soil biochar amendments increase and maintain soil fertility (2) and the human-made Terra Preta soils in the Ama-zon prove that infertile soils can be transformed into fertile soils and long term carbon enrichment is feasible even in environments with low carbon sequestration capacity (3). Throughout the world intensive agriculture often has resulted in soil physical and chemical degradation, to due erosion and higher output than input rates of nutrients and OM. In contrast, the intentional and unintentional deposition of nutrient-rich materials within human habitation sites and field areas has in many cases produced conditions of heightened fertility status (Woods 2003). Biochar was also used in agriculture in the past (Allen 1846; Ogawa 1994; Ogawa 2008). Terra Preta soils in the Amazon are among the most prominent examples of human enriched soils. Sustainable soil fertility management is a major constraint in the humid tropics and is probably one reason for Terra Preta’s high degree of public awareness. ​Further the difference between Terra Preta and ordinary soils in its vicinity is striking. In contrast to yellow or reddish Ferralsols the Terra Preta is dark (black). Terra Preta is rich in calcium and phosphate. These two elements are scarce in the Amazon basin and its presence alters fertility and ecology of the landscape distinctly. Terra Preta has an elevated pH in comparison to the surrounding soils (Ferralsols, Acrisols, and Arenosols) which are acidic with toxic levels of exchangeable aluminum (Glaser and Birk 2012). Current major environmental threats such as deforestation and global warming contribute to Terra Preta’s wide public perception. The existence of an anthropogenic and carbon (C) enriched dark soil in different parts of the world and especially in Amazonia (Amazonian Dark Earths (ADE) or Terra Preta de Índio) proves that the predominant Ferralsols and Acrisols can be transformed into fertile soils. Charcoal formation and deposition in soils seems to be a promising option to transfer an easily decomposable biomass into refractory soil organic matter (SOM) pools. The production of charcoal for soil amelioration purposes (slash and char) out of the aboveground biomass (secondary forest and crop residues) instead of converting it to carbon dioxide (CO2) through burning (slash and burn) could establish a C sink and could be an important step towards sustainability and SOM conservation in tropical agriculture. On a global scale, crop residue biomass represents a considerable problem as well as new challenges and opportunities. Bio-char soil management systems can deliver tradable C emissions reduction, and C sequestered is easily accountable, and verifiable. ​The described mixture of driving forces and technologies has the potential to use residual waste carbon-rich residues to reshape agriculture, balance carbon and address nutrient depletion. ​depending on how much charcoal you want to make. ​Make sure it has a flame-proof lid. 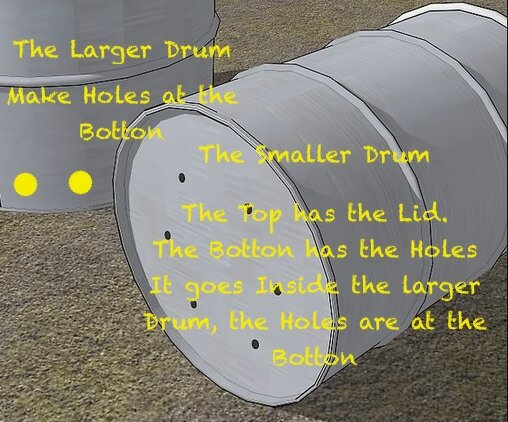 The smaller drum has holes. It goes up side down in the larger drum. The holes are at the botton. Make the fire from the top of the drum. You can put a chimney over it for better burning. soil scientist Jon Nilsson and Patryk Battle.